Life’s painful trials can bring shame about our inadequate and broken faith. There is relief in hearing the expressions of desperation in the psalmist’s voice. He didn’t experience this life perfected, and we don’t either. But the psalmist was loved. So are we. To walk through darkened days is part of the human experience. Our eyes are often clouded to those blessings by the thing oppressing us. When we remember and recognize our Father’s faithfulness, when we see reality with the eyes of understanding, the darkness ebbs and the light of hope grows. These letters were originally written as encouragement to a friend when the darkness began to overtake his path. Each day for 22 days, a letter arrived with one of the eight-verse sections from Psalm 119 along with a small thought to bring light and hope and to be a reminder that we do not fight our battles alone. 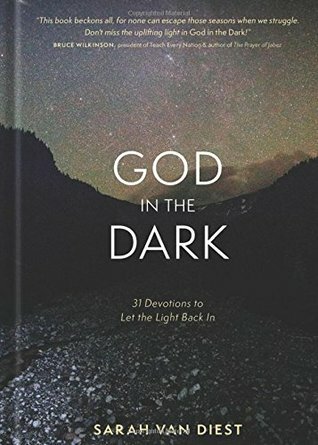 When these devotions were augmented by nine on the subject of experiencing God in the dark, a 31-day devotional was created. God in the Dark is a a 31-day devotional based primarily on the 22 sections of Psalm 119. Each day's entry contained the verses to read then 2-4 pages of encouragement from the author, loosely based on the verses. The overall theme of the devotional was the dark times in our life when we struggle with pain or doubt and ways to let the light of God back in. In the Psalms, we can see this turning of our focus from our problems to our God and His faithfulness. The devotions were quick to read and were overall encouraging toward those who are struggling.